… as a three-and-a-half-hour experiment. I had never attempted a portrait in oil pastels, and wanted to try one using a limited palette of four shades, similar to those which have worked well for me in several soft-pastel portraits. 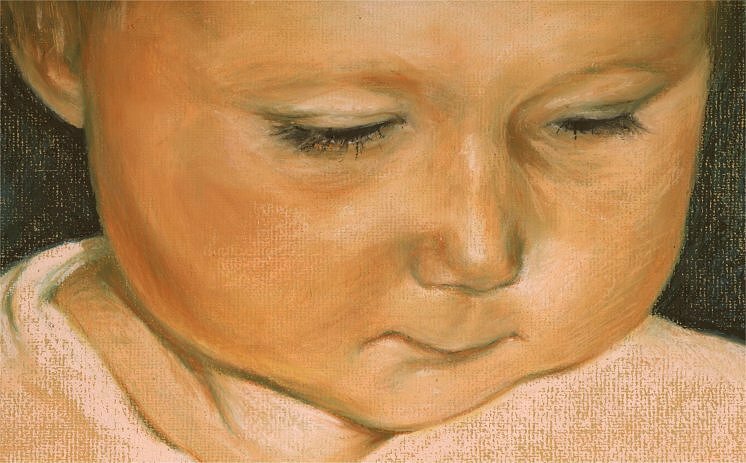 I built up the image on warm-tinted Ingres paper in Neocolor II (wax pastels) and Neopastel (oil pastels), blending with fingers and kitchen towels. It’s about 8×5″. The highlights have scanned rather harshly, and I can see a couple of details I may be tempted to tweak; but I can’t help but be happy to see that little face on the page. This is EDM Challenge #54: Draw someone you love. Beautiful! It is so tenderly done – love the cropping and angle that you chose. What an amazing job you’ve done. I always find I can’t draw anything with oil pastels unless it is very large. That is so beautiful, working so small. fantastic – thanks for posting this! The love you have for your little girl bursts out from this little painting and you have done so well with a limited palette. I too enjoy a limited palette, I think it unifies everything in a way that is really appealing.So nice to see something new here EJ. Oh – you should b every proud of this. It’s a wonderful portrait of a gorgeous little girl. Nice! I can feel the smoothness of the baby’s skin. It’s really good to record like this. Your choice of composition makes this portrait powerful — you narrowed it down to a moving expression. Your choice to limit yourself to a palette of colors is very efficient too. Oh, a lovely portrait of a lovely little girl. I’m with everyone else, composition, light and color, it is gorgeous! And I know what you mean about not being able to work for an extended period of time. Glad you found the time for this one! So beautiful. I love her little smile. This is indeed beautiful, E-J, and I’m delighted to see you daughter is following in your artistic footsteps.